Appearance: Very pale, practically clear, with nice, spritely persistent bubbles. On the palate: Sweet and foxy. The Muscat and Cayuga make their presence plainly known but are restrained (barely). Table grapes, Granny Smith apples with a hint of perfume and persimmon. Finish: Tart and tingly but mellows within 20 seconds or so. 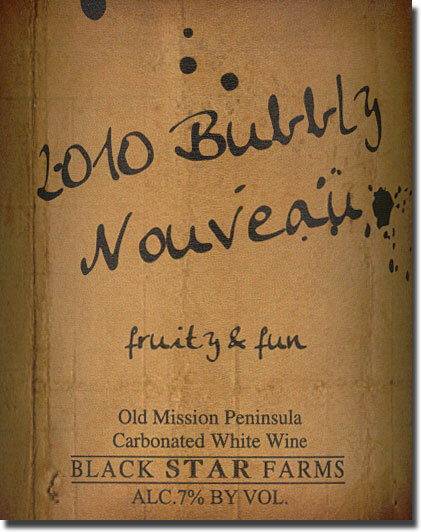 Parting Words: Bubbly Nouveau is a fleeting annual release from BSF. As one might expect from the name, it is recommended that this one be consumed promptly. I can’t imagine it getting much tarter than this and being enjoyable. Not everybody enjoys foxy native grape wines or Muscat but I do. This is a fun, rustic American wine that doesn’t require a lot of attention and is best drunk fast and early. Recommended. NOTE: The original version of this review stated that Riesling was also used to make the 2011 vintage of Bubbly Nouveau. That is not correct. Thanks for the correction, @bstar2009!